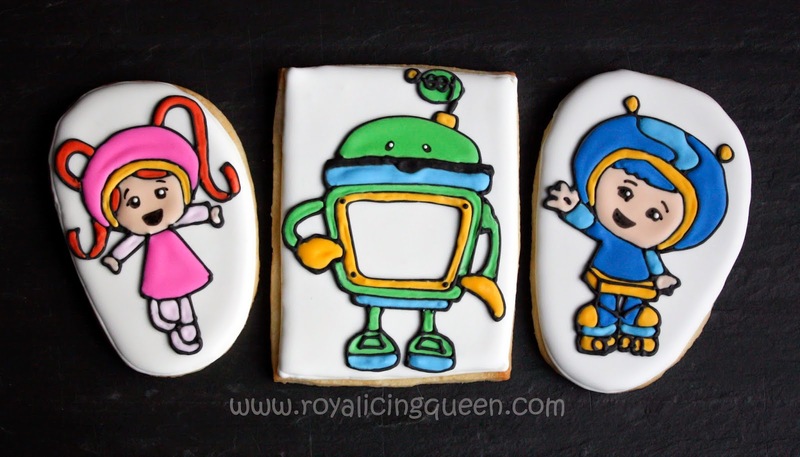 My projector came in handy when making these cookies. I cut out my own rectangular shapes from the cookie dough because I did not have a rectangular cookie cutter that was quite wide enough for bot. I used a flip flop cookie cutter for the other two. I flooded the cookies with white royal icing and let them dry completely (overnight). The I outlined the character shapes in black with a PME tip # 1.5 using the projector images as a guide. Next, I flooded the sections with the appropriate colors. I added some remaining details in black. The only details I left until the next morning were the mouths and eyes. I waiting until the characters were completely dry to draw these with a black food dye marker. I used the FooDoodler brand of markers because I appreciate their fine tip for adding these smaller details. For the last step, I added a small spot of white royal icing onto the eyes. The thin areas that I filled with colored icing became a cratering nightmare. These formed while the icing dried. I've made cookies similar to these (the Dr. Seuss cookies) so I had expected this. I pulled my scribe needle through the narrower sections in an attempt to prevent the craters from forming, but it wasn't 100% effective. I filled in most of the craters with icing after they formed with the same colored icing. It wasn't a perfect solution but it helped improve their appearance.